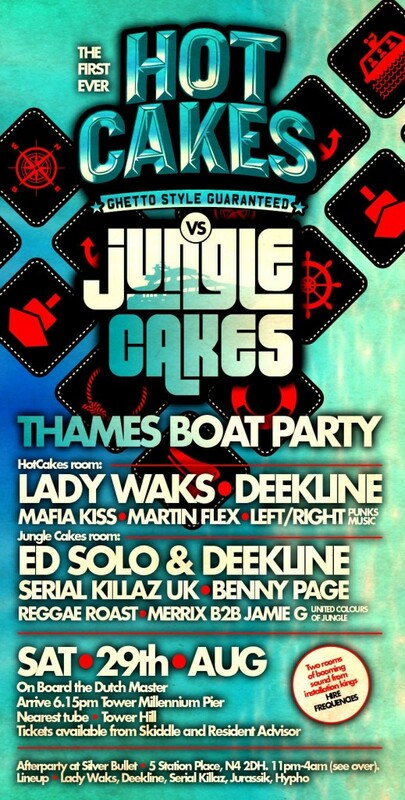 For the first time ever in London we’re uniting the Hot Cakes tribes and bringing you a banging two-floor bank holiday boat party with a spectacular lineup, backed by the sonic soundsystem wizards from Hire Frequencies on board one of the Thames’ biggest cruisers. This. Will. Be. Enormous. Hot Cakes afterparty at Silver Bullet, 5 Station Place, N4 2DH. 11pm-4am. Tickets to the intimate afterparty are extremely limited and will sell out before the boat does. The Silver Bullet boasts a full Void soundsystem and is one of the best intimate spaces in London, right opposite Finsbury Park tube with a friendly vibe and wicked staff. Deluxe tickets take you straight from the pier to the door of the afterparty venue.